On January 6, 1880 Thomas Hezikiah was born in the small community of Mix Run Pennsylvania. Tom didn't care for school much so after the 4th grade he dropped out to seek employment. Work didn't agree with him eather so he spent most of his time playing sports and laying around under shady trees. In 1895 The Cuban Revolution threatened American interest on the small island. So Tom who was now 15 years old, joined the army. Toms appetite for adventure would have to wait because his outfit was never deployed to Cuba. In the fall of 1902 Tom was discharged from the army. The thought of returning to the cultured life of the east no longer appealed to him. So he headed to Oklahoma, where he held a variety of jobs, physical fitness instructor, bartender and rodeo cowboy with the Miller Brothers "101 Real Wild West Show". 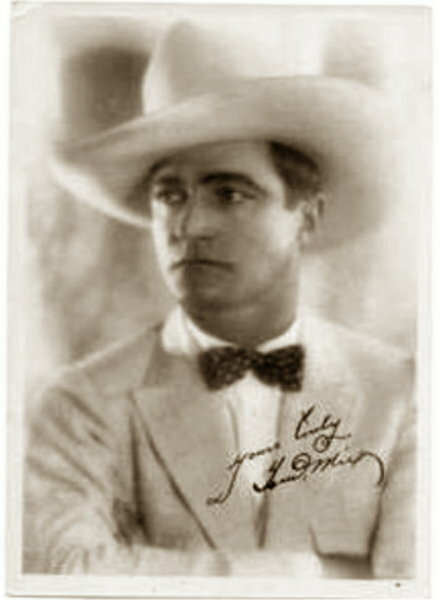 Tom started his movie career in 1909, when "Selig Polyscope Movie Company" came to Oklahoma to film a documentary western titled "Ranch Life in the Great South West". He handled the stock until Colonel Selig became aware of his many abilities, after which he was given a major part in the "Saddle Bronc" segment. From 1910 till 1917 Tom was a regular for Selig and appeared in around 65 silent films. When the company broke up because of financial hardship, Tom signed a lucrative contract with "William Fox Studios". He was by now a seasoned performer and it showed in his movies. In 1922 his salary had risen to roughly $17,000 a week. After 11 years Tom and His favourite co-star Tony the Wonder Horse, left the Fox Studios. His time with Fox resulted in 78 fast action western adventures and a mystique that is still talked about today. Tom became the leading box-office attraction and number one cowboy star, not just in America but around the world. Tom became the characters he played in the movies and the kids loved him. In real life Tom owned a ranch, several cars, horses and houses. 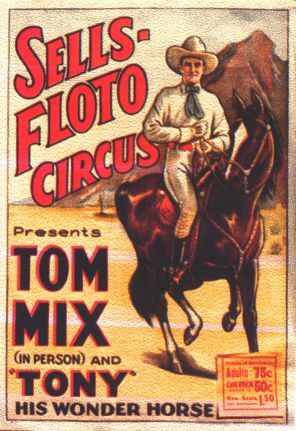 In 1928 Tom signed with The Film Booking Office (Latter RKO) for a short series of mediocre silent westerns.As the sound era came about, Tom retired and became the number 1 attraction in the "Sells Floto Circus" from 1929 to 1931. 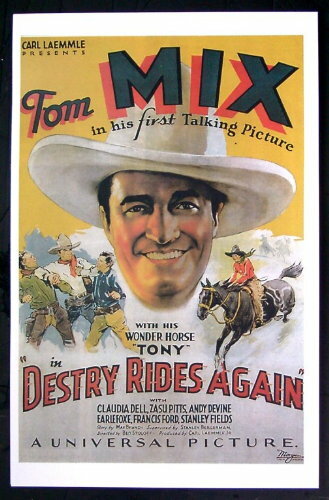 In 1932 Tom was drawn back into movies when Universal Pictures came to him with the script for "Destry Rides Again." Tom and Tony Jr. made 8 more films for Universal but at the age of 52 and the scares of countless injuries from doing his own stunt work, Tom just couldn't perform like he used to. 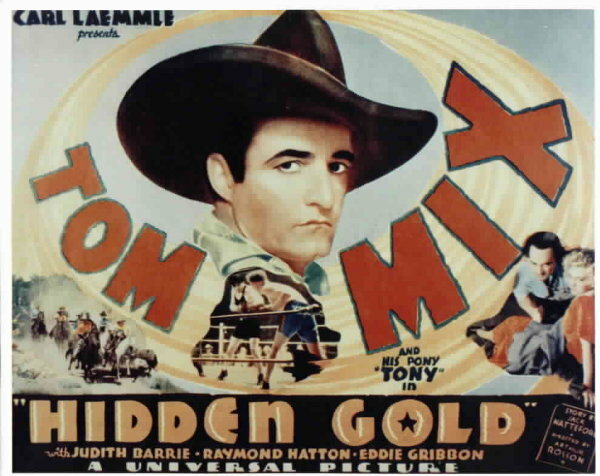 Tom formed the "Tom Mix Circus" and traveled with it until its closure in 1938. This was not a good time in his life, his financial burden and failing health was the cause of great mental stress and the start of a drinking problem. This all changed when a European tour he made in 1938-39 was warmly received. Tom's confidence and enthusiasm were restored and he wanted to return to the silver screen, but this never happend. Toms life ended on October 12, 1940. upon returning from a personal engagement in Tucson Arizona, his car ran into a ditch and his neck was broken by a suitcase containing silver dollars. 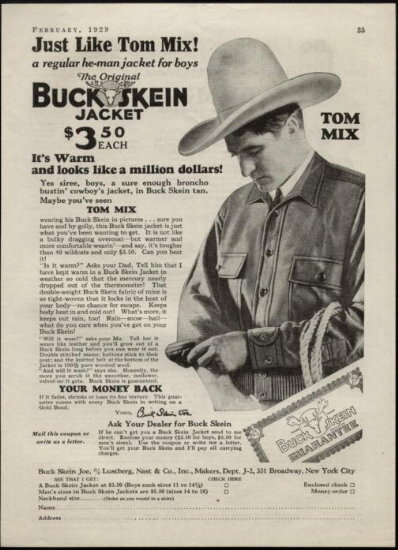 Tom's longevity and vast appeal is evident by the popularity of the Ralston Tom Mix radio show that ran from 1933 till 1950, which Tom never appeared in him self. The radio show bred a huge fan base and countless give away premiums and books. 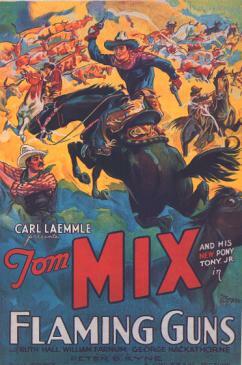 Every Tom Mix fan was a Strait Shooter. This story is the way the people at Ralston thought Toms life should have been. This is the way it is written in the Life Of Tom Mix and Secret Manuel of the Tom Mix Ralston Straight Shooters. Tom was born in a log cabin in not far from El Paso Texas. A true son of the old west, he grew up among hard-riding cowboys and bands of roving Indians. As a boy, Tom grew up in the saddle, learning to ride, rope, and shoot. Tom has been called the greatest rider who ever lived. No man ever loved horses better. Always intensely patriotic, Tom joined the army and went to Cuba during the Spanish-American War. He was badly wounded in a daring charge. But robust Tom recovered. When the Boxer Rebellion broke out in China. Once again he was wounded when an ammunition wagon was blown up by a shell. Tom handled horses so skilfully, the British sent him to Africa during the Boer war in charge of the cavalry mounts. When the war ended, news from America brought him hurrying home. Bad men and killers were staging a reign of terror in the west. On his return, the fearless Tom was elected Sheriff and took up the fight for law and order. Tom used a gun only when he had to. His cool courage and daring made him feared by lawbreakers. Recognizing this, the Government named him U.S. Marshal. When trouble broke out along the Rio Grande, Tom joined the famous Texas Ranger. Wounded time and again in gun battles, Tom's rugged health always pulled him through. Having helped wipe out crime, Tom returned to ranching. In the Pendleton, Oregon, Rodeo he won the title, "World's Champion Cowboy" and was given a movie contract. In Hollywood Tom discovered Tony, bought him and trained him to be the world's "Wonder Horse." Tom and Tony braved every danger together to thrill millions. Never using a "double," Tom became the star of stars. For years he was Hollywood's highest-paid actor and made more pictures than anyone on the screen. Always in demand for personal appearances, always eager to show city people the glamour of the west, Tom organised a huge motorised circus and toured America.